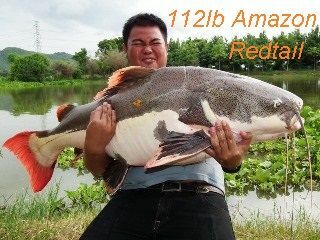 Although only a small lake of around 3 acres it holds specimen fish of many species, including arapaima to 226kg, chao phraya catfish to 96kg, mekong catfish to 137kg, stingray to 100kg+, amazon redtail catfish to 51kg, thai redtail catfish to 32kg, wallago leeri to 65kg, wallago attu to 27kg, goonch to 33kg, pacu to 23kg and many carp species including siamese carp to 78kg+, catla carp to 32kg+, juliens golden price carp to 22kg, mrigal to 9kg+, and rohu to 18kg+. 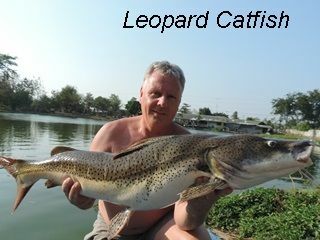 The lake is stocked with 100+ species of fish both predatory and non predatory, with most of the species originating predominately from Thailand, India, China and South America. 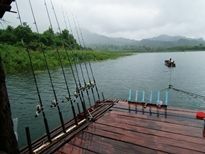 The lake is open to fishing from 08:00am to 08:00pm all the year round. 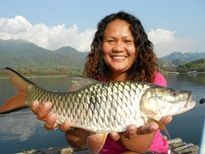 Friendly guides are available to give advice on angling techniques and help with the netting and photographing of your catches. 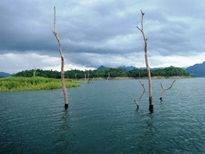 The predatory species at Palm Tree Lagoon mainly fall into two categories Amazon (pictured above) and Thai (pictured right). 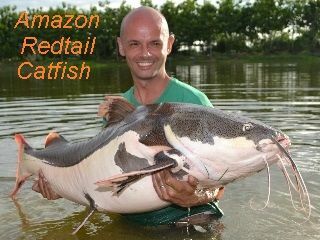 The Amazon predators include Arapaima, Redtail Catfish, Barred Sorubim, Redtail Tiger Catfish, Lau Lau, Firewood Catfish, Pacu and Tambaqui. 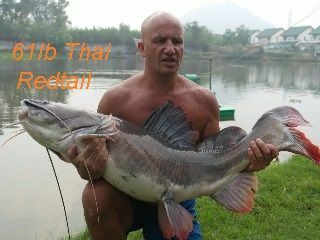 The Thai predators include Chao Phraya Catfish, Thai Redtail Catfish, Wallago Leeri and Attu, Freshwater Stingray, several species of featherback and snakehead. 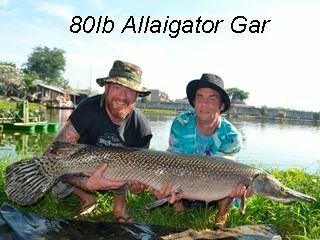 In addition to these the lake is also stocked with Alligator Gar, Black Gar and Barramundi. 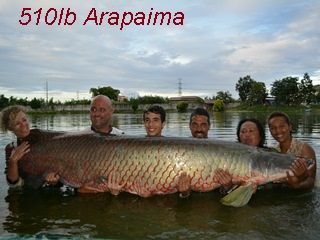 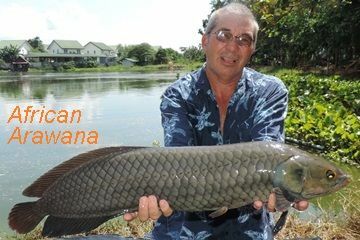 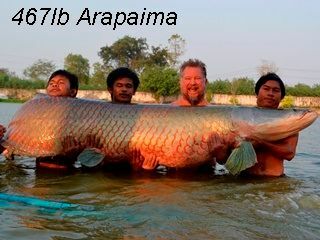 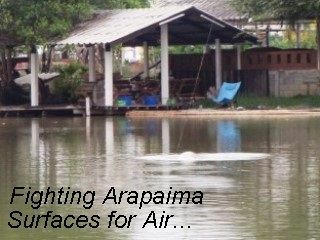 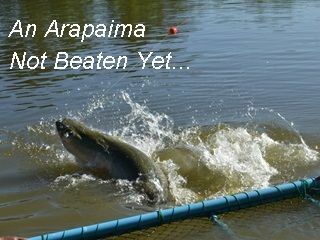 The big arapaima are almost exclusively caught on chicken as with the bigger Gar. 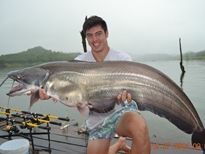 The rest of the predators also respond well to chicken as well as both live and dead baits (batu). 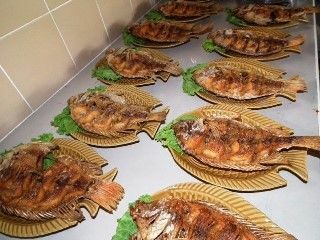 The carp species like Giant Siamese Carp, CatlaCarp, Rohu, Black Carp, Juliens Golden PriceCarp and Mrigal, and non-predatory catfish species like the Giant Mekong are mainly caught on lum or bread. 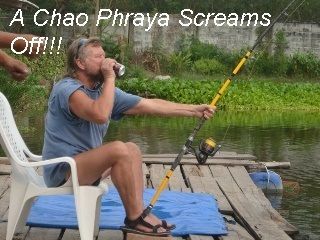 Some species which are supposed to be predatory like Chao Phraya, Tambaqui, Redtail, Redtail Tiger and Pacu can get caught on absolutely anything. 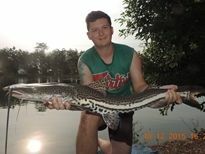 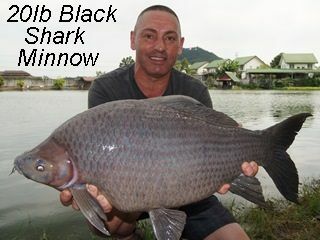 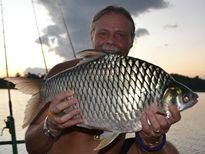 One thing you will notice for sure is that when fishing in Thailand the power of all the warm water species present in the lake puts their cold water cousins in Europe to shame and that together with the size of many of the fish (with 8 species to date having been caught over the 100lb mark) making angling in Thailand a truly unforgettable experience. 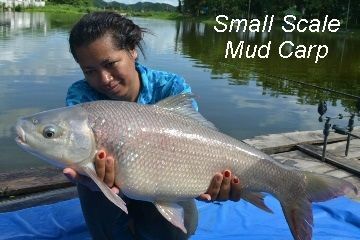 There are also many other smaller species and more unusual species also to be caught. 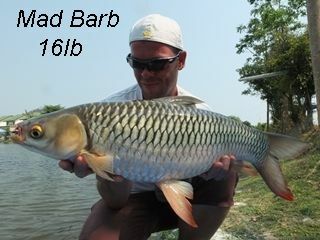 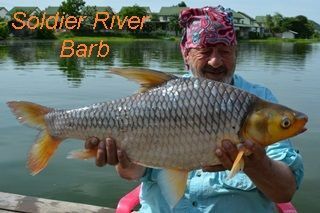 Such as the lesser known carp species like small scale mud carp and soldier river barb. 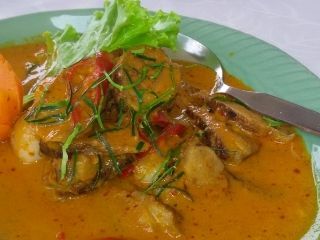 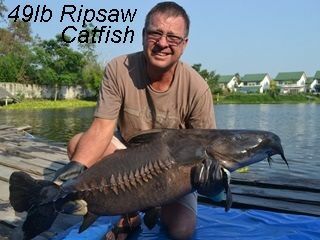 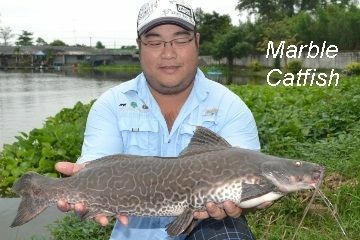 Some of the more exotic catfish species include firewood catfish and marble catfish as well as the rare regional species from the Burmese border like.Salween catfish and Salween rita. 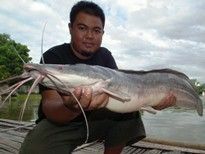 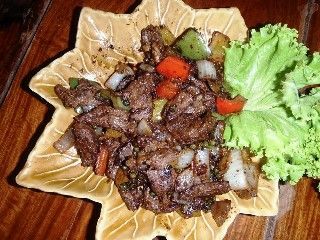 There are also a few more unusual Thai species like the fire eel and the goonch catfish.Then there are also some African species like the African walking catfish, African arawana and giraffe catfish. 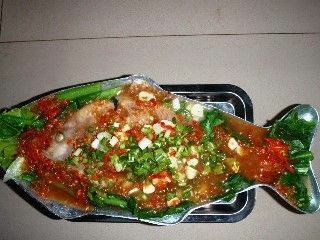 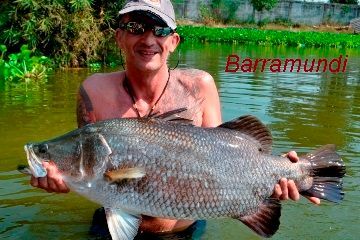 There are also a lot of other predatory species like barramundi from Australia and yellowcheek carp from China. 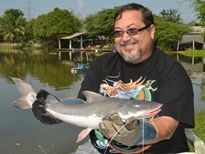 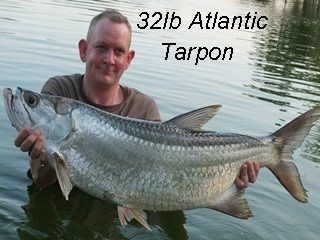 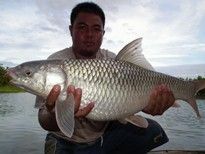 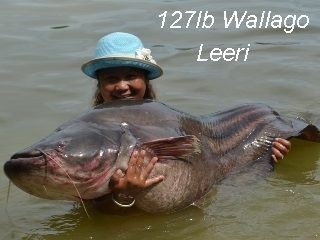 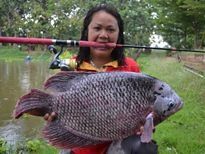 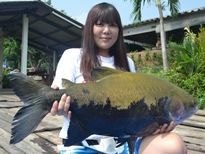 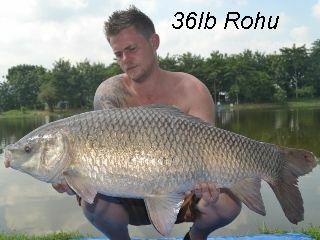 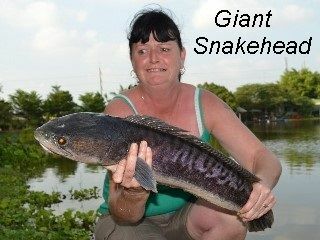 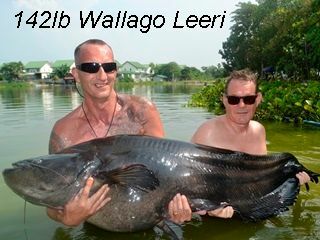 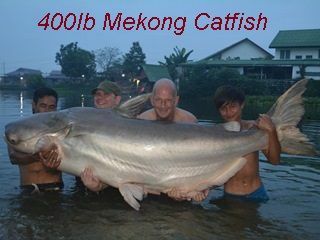 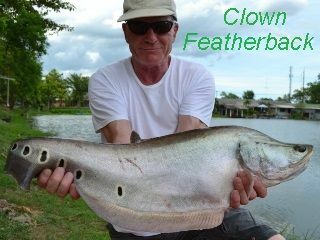 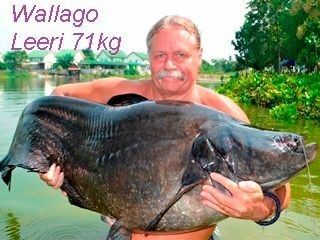 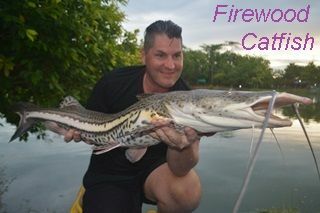 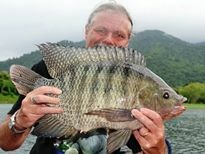 For a better idea of what can be caught when fishing in Palm Tree Lagoon Thailand check out the photos in the fish species and gallery pages. 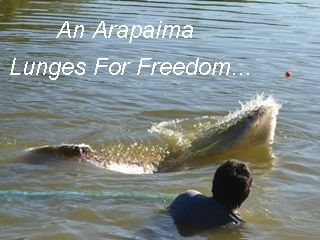 You can now follow us on facebook. 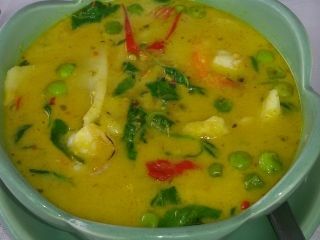 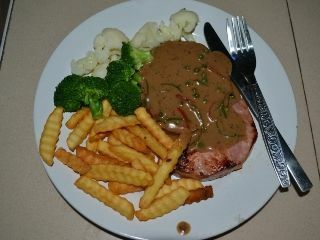 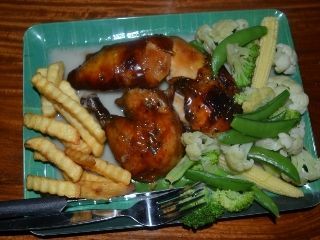 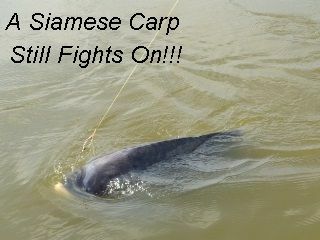 Please click on and like our facebook pages. 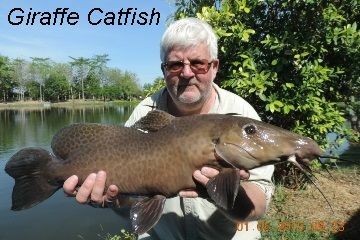 It is much easier to follow our latest catches on our facebook pages timeline than in our galleries. 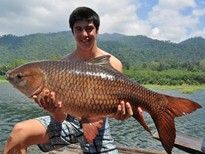 Palm Tree Lagoon in conjunction with legendary Thai fishing guide Mr Ay are now offering is addition to guided carp fishing to Khao Laem Dam located in Kanchanaburi province, snakehead and wallago packages as well. 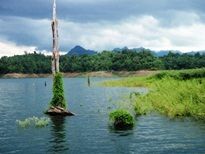 Khao Laem Dam is a huge expanse of water over 60km long and 25km wide at its widest point. 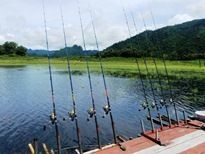 The carp fishing area is located in a wilderness area of unparalleled natural beauty amidst the hundreds of island situated at the northern end of the dam against a picturesque mountainous backdrop. 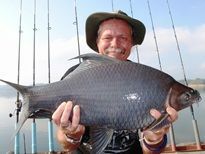 Mr Ay has lived on the water for the past 29 years and is expertise at locating feeding shoals of Rohu (Indian Carp) and Black Carp (Black Shark Minnow) is surpassed by none. 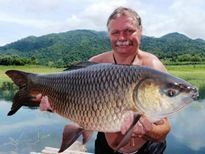 The carp fishing itself is performed from purpose built Carp Fishing Rafts which are secured over areas where carp have been observed jumping are are prebaited for 10 days prior to fishing. 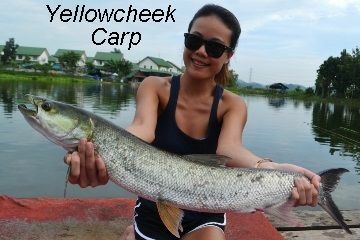 Top water lure fishing for snakehead and jungle perch is also available, as well as seasonal wallago (Great White Sheatfish). 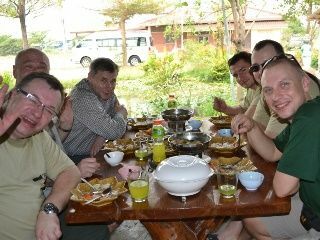 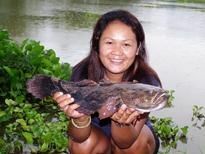 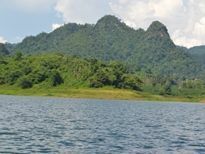 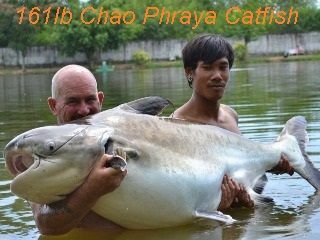 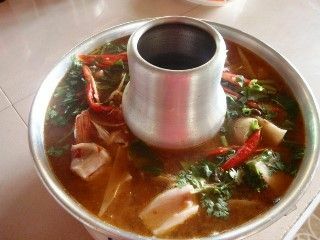 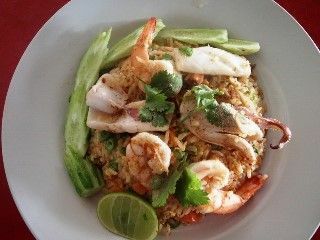 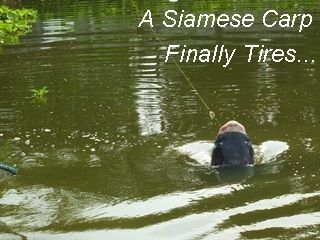 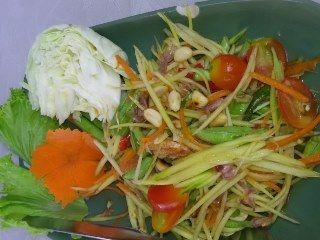 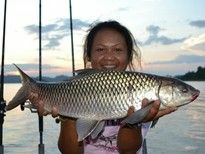 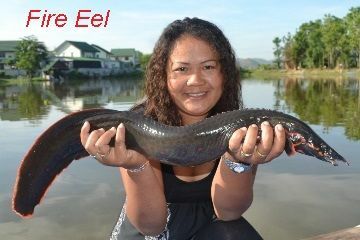 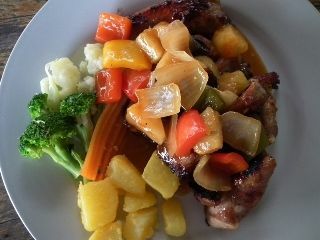 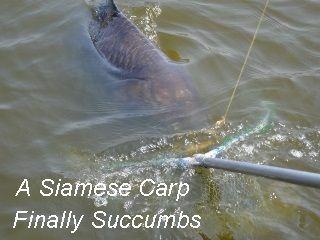 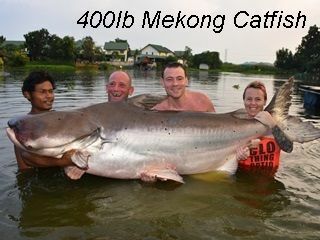 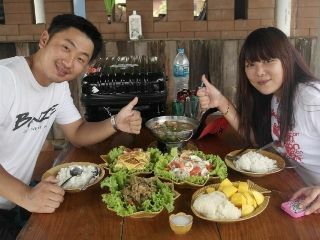 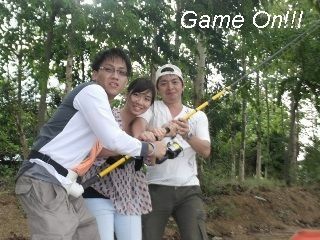 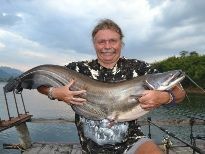 For more information see Fishing Khao Laem Dam and for pricing and itineraries see Fishing Rates Khao Laem. 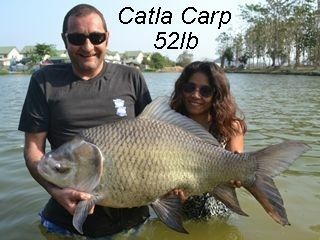 Obviously the main species we are targeting when carp fishing are the rohu (Indian Carp) and the black carp (black shark minnow). 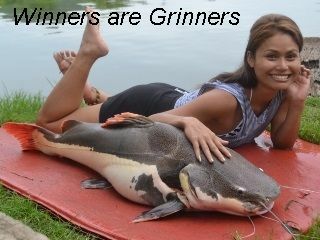 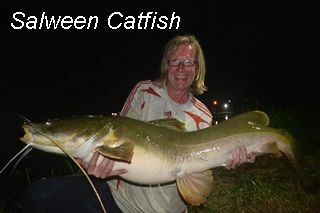 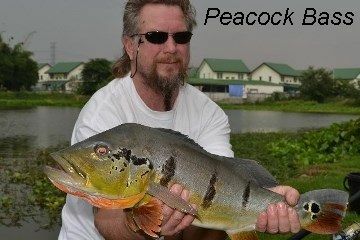 But other species do come along and often get caught including mrigal, yellow catfish, java barb and tilapia. 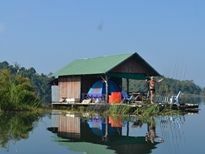 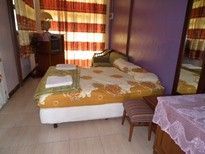 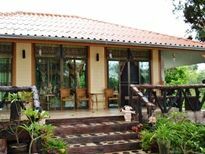 You have a choice of accommodation, camping on the carp raft for the adventurous or staying in the nearby guest house for those who enjoy their creature comforts. 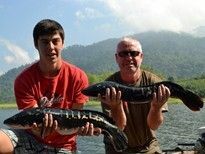 We were lucky enough during the year to get our hands on a number of great fish from various sources, some caught in the wild and others bred and grown on by successful fish breeders, to add to our already impressive stock of monster fish. 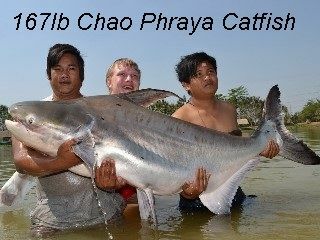 The biggest fish we stocked were during November when a number of very large Mekong catfish weighing between 280 and 380lb were released, and added to the existing good stock of fish. 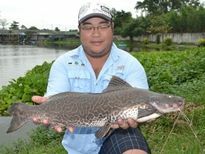 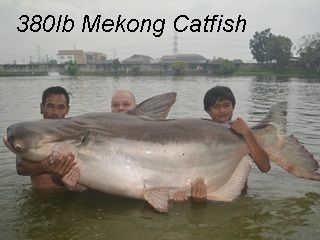 These have been caught on a regular bases and as a result a record 18 Mekong catfish over 300lb were caught in the first month January of 2017. 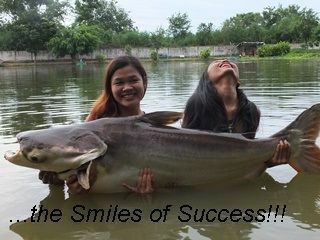 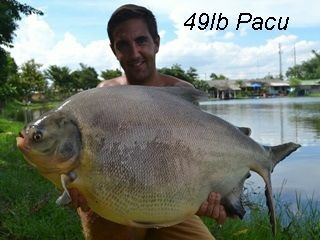 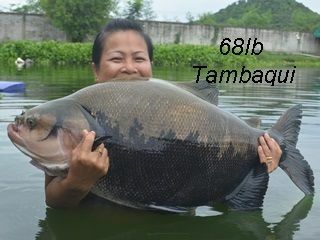 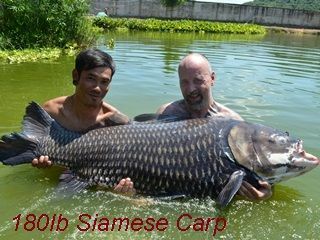 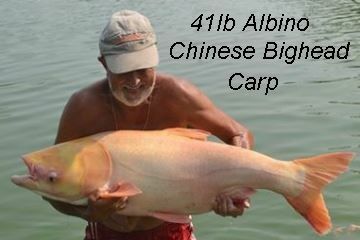 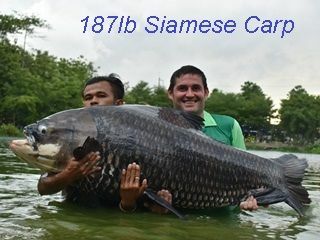 During 2016 we were lucky enough to obtain a number of large Siamese Carp the biggest weighing in at a colossal 222lb. 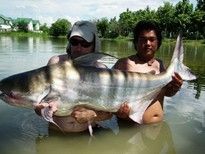 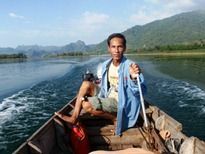 The Palm Tree guides and many of our fishing friends frequently fish the many rivers and dams in central Thailand, in particular the Mae Klong river system that includes both Khao Laem and Srinakarin dams as well as the Salween river up on the Burmese border. 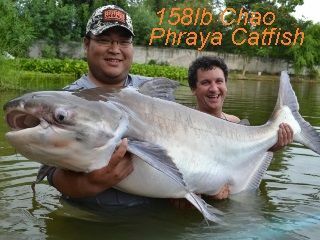 Salween Rita and Salween Catfish originally caught from the Salween river that borders Thailand and Burma. 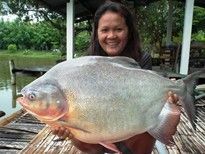 Large Pacu caught on small lures from the Mae Klong river and Goonch caught on deep diving lures form the river Kwai Noi in Kanchanaburi province. 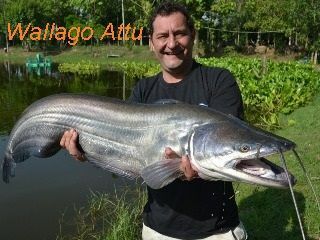 Wallago Attu, Wallago Leeri and Giant Snakehead caught by a variety o methods from Khao Laem Dam again in Kanchanaburi province. 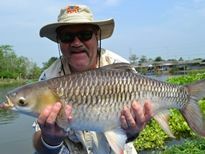 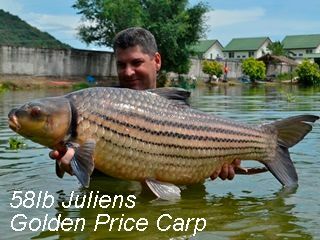 The Mae Klong river is well known for it's huge head of carp species, the largest and most stunning of these being the Juliens Golden Price Carp. 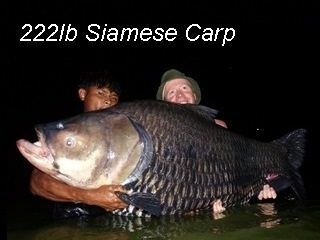 We fish a couple of locations on this mighty river pre-baiting for a number of days, and if we are lucky catching these most spectacular looking of all the carp species and transferring them to Palm Tree Lagoon. 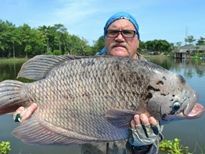 The largest one caught in 2016 tipped the scales at 71lb. 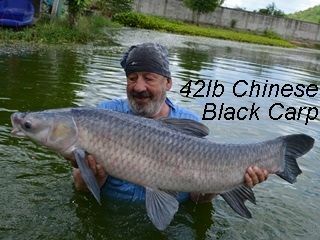 We managed to stock some magnificent specimens in all three Chinese carp species, namely Chinese Black Carp, Chinese Bighead Carp and Chinese Silver Carp. 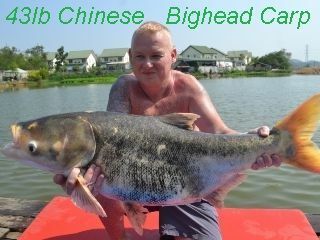 The Bighead Carp and Silver Carp were caught from a local dam and transferred to Palm Tree Lagoon. 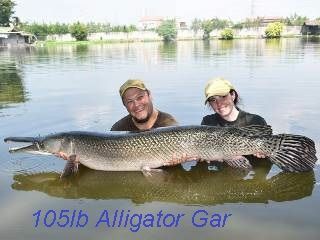 We stocked a number of great alligator gar during the year ranging from 70lb to 105lb. 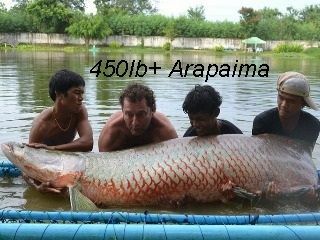 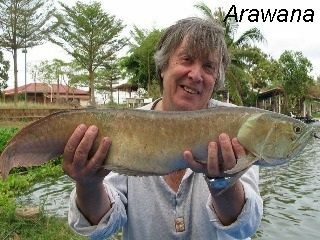 We also stocked a number of good sized Arapaima and some more Ripsaw Catfish. 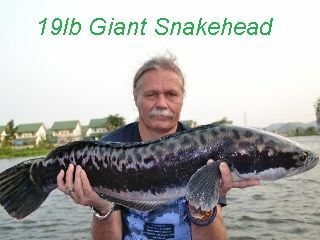 Not wanting to leave the African continent out we also stocked some o the more unusual species from the dark continent including African Arawana, Giraffe Catfish and Vundu Catfish. 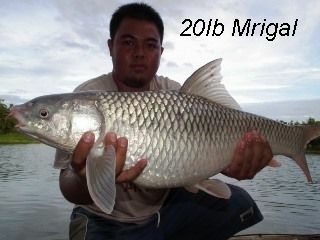 It has also been a good year for some of the lesser known Palm Tree Lagoon Species. 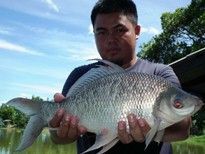 This is good news for anglers who not only chase the big fish but like to catch new species as well. 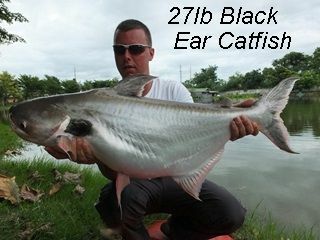 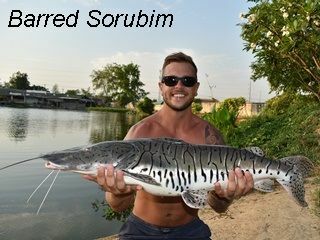 With a number of species native to Thailand like Black Ear Catfish, Marble Goby, Asian Redtail, Thai Mahseer, Giant Featherback, Elephant Ear Gourami, Black Shark Minnow to name a few being caught. 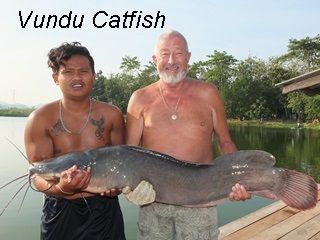 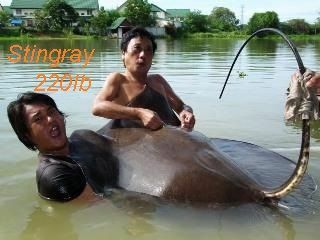 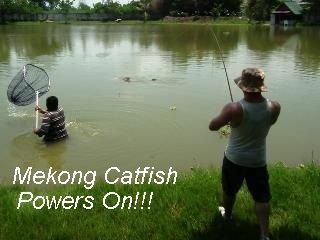 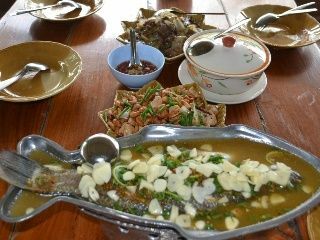 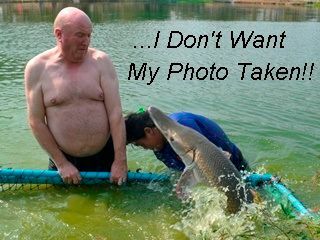 Local Thai fishing entity Mr 'Bung' surprised many with his latest success using of all things 'Banana' as bait. 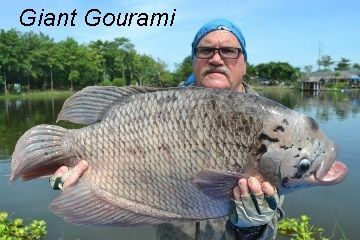 He was originally trying to catch one of the many big gourami that have proved elusive so far this year. 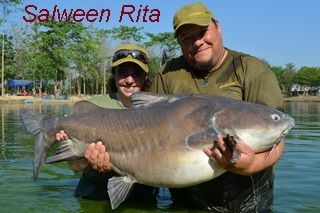 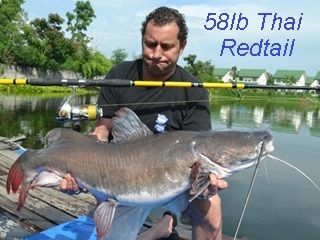 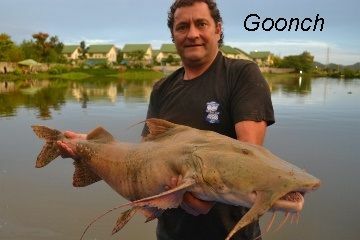 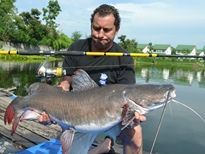 He may have failed on the gourami front but he did eclipse four Palm Tree Lagoon records with a Redtail Catfish of 51kg (the first Redtail Catfish in Thailand to be weighed at over the 50kg mark), a Mrigal of 9.2kg (double the existing IGFA record), a Bony Lipped Barb of 1.8kg and a 12kg African Walking Catfish. 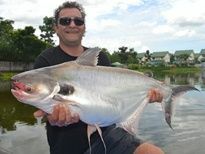 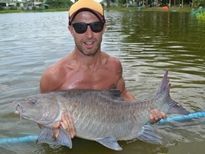 Not to be outdone, Palm Tree Lagoons owner and Mark a customer from the UK also successfully gave Banana a go with the former landing a 15kg Pacu and Mark a 50kg+ Chao Phraya catfish. 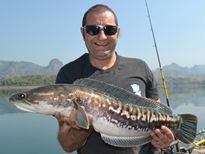 Andrew John Wakefields also got into the banana action with a cracking Mad Barb and an awesome Giant Gourami. 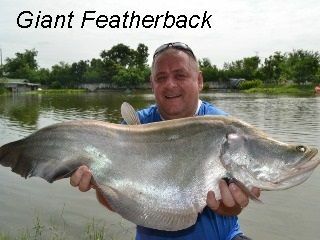 Benny then went onto to break the IGFA all tackle Giant Gourami record on banana.